Five Bahamians were made Knights and Ladies of the Order of the Holy Sepulchre during ceremonies at St Patrick’s Cathedral in New York City on Friday, November 18, 2016. 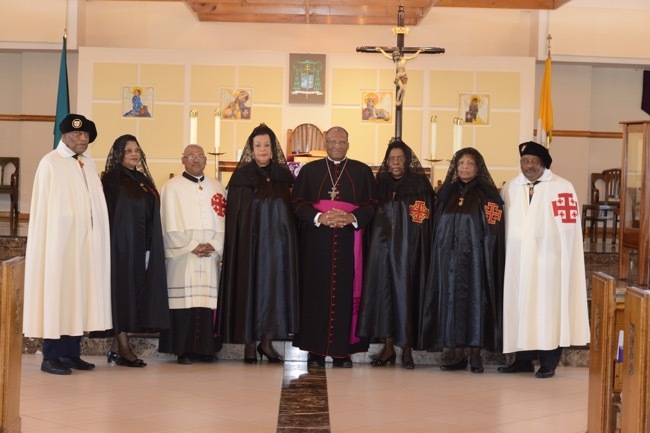 Monsignor Alfred Culmer, Chancellor of the Archdiocese of Nassau and Pastor of St Joseph’s Parish, Basil and Cheryl Albury of St Anselm’s Parish, Patricia Coakley of St Joseph’s Parish and Elma Garraway of the Church of the Resurrection were invested as Knights and Ladies of the Equestrian Order of the Holy Sepulchre of Jerusalem. The ceremonies took place at St Patrick’s Cathedral in New York City by the Grand Master of the Order, Edwin Cardinal O’Brien in the presence of Timothy Cardinal Dolan, Archbishop of New York and Grand Prior of the Order’s Eastern Lieutenancy of the United States. In the Archdiocese of Nassau they join Burton and Camille Hall who were admitted to the Order in 2009 and who now hold the rank of Knight Commander and Lady Commander, respectively, and Deacon Michael Checkley, Administrator of Holy Name Parish in Bimini, who was admitted to the Order in his native Canada and who now holds the rank of Knight Grand Cross. The Order of the Holy Sepulchre is a Roman Catholic Order of Knighthood that traces its roots to circa 1099 under Duke Godfrey of Bouillon, "Defender of the Holy Sepulchre", one of the leaders of the First Crusade. It is the only order of chivalry, together with the Sovereign Military Order of Malta, that is recognised and protected by the Holy See. The Pope is sovereign of the order. The order today is estimated to have some 30,000 members in 56 lieutenancies around the world. As there is not yet a lieutenancy in our region, at the instance of Archbishop of Nassau, Archbishop Patrick C. Pinder, STD, CMG, has been included with those states, which comprise the Order’s Eastern Lieutenancy of the United States, the Catholic Church in The Bahamas having historical ties with the Church in New York. Admission into the Order means taking on a commitment for life to be a witness to the Faith, to lead an exemplary Christian life of continuing charity in support of the Christian communities in the Holy Land, and to maintain the true charitable commitment of a Christian. The purpose of an individual in joining the Order is to serve the Catholic Church and to support the efforts of the Church and the Latin Patriarchate of Jerusalem to maintain the Christian presence in the Holy Land. Within the Catholic Church, members of the Order are entitled to use the courtesy titles “Sir” and “Lady” (or “Dame” with effect from 2017).